This simple fall salad is loaded with goodies! We've got roasted acorn squash, pomegranate seeds, pumpkin seeds and an amazing creamy tahini dressing too! 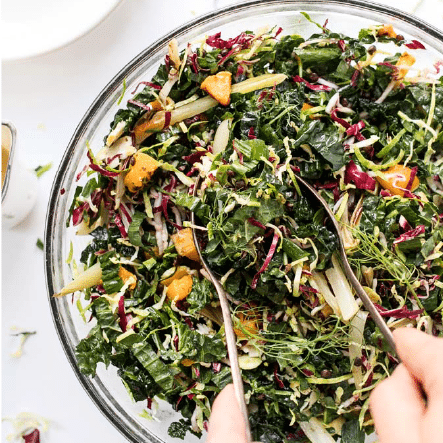 It's been a while since we posted something green, so today I'm sharing one of my favorite fall salad recipes! While our bodies might not be craving salad in the colder months, I do think there's a way to make a delicious salad that is comforting and cozy. The secret? Using roasted vegetables as part of your mixture! By adding something roasted to your salad, you're able to bulk it up with a warm food that your body (and digestive system) will love. Today's roasted star? Acron squash! 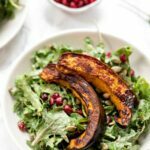 If you haven't tried acorn squash yet, oh boy you're going to love it! We grew up with acorn squash in the fall and winter and the way my dad used to make it, made me fall in love. He would roast it with some maple syrup and a little salt and pepper, and sheesh. SO GOOD! 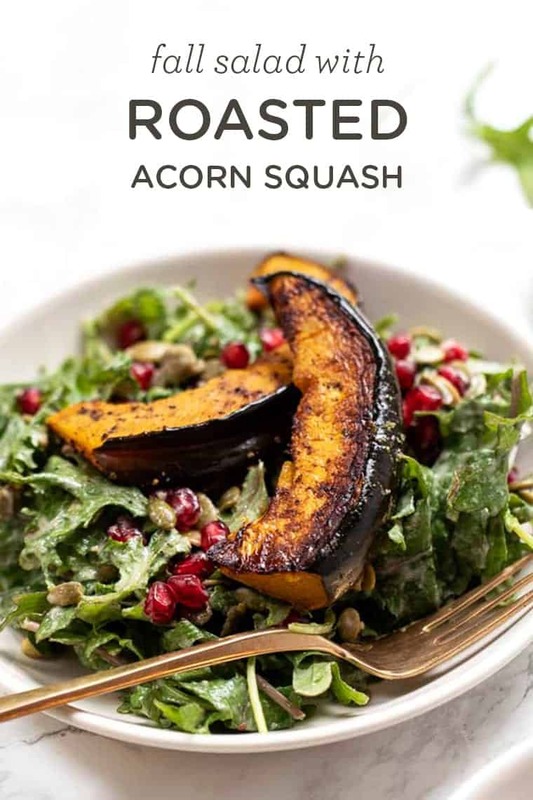 Acorn squash has a sweet flavor, soft yellow flesh and tons of vitamins. 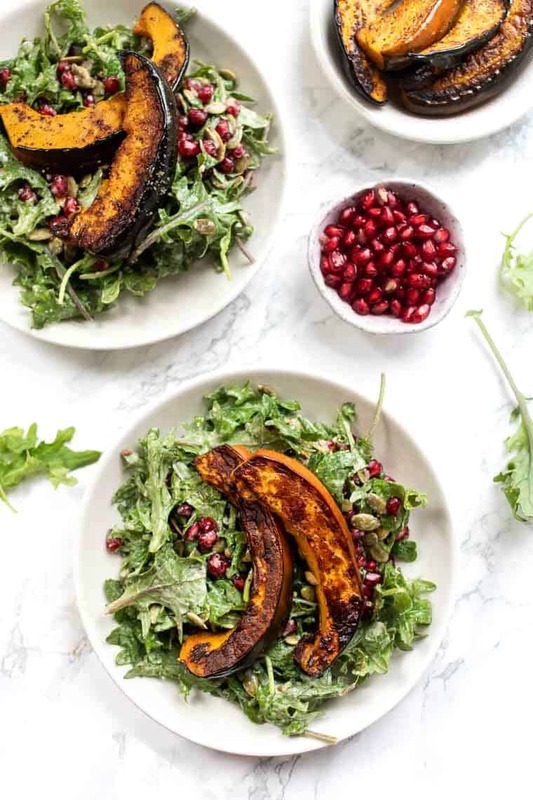 Acorn squash is high in vitamin C, A, potassium, and magnesium. 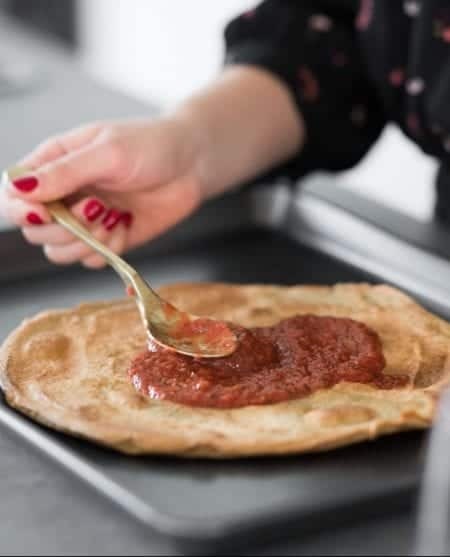 And it's also packed with fiber, is low glycemic and as I said…it tastes amazing! When it comes to this healthy fall salad, I wanted to make sure we're really packing a punch in the ingredient department. We're using baby kale as the base – because honestly, that's what I found at the grocery store – but you can use whatever works best for you. Arugula would be awesome. Spinach would be delicious. Even mixed greens or romaine would work. Pomegranate Seeds: I chose pomegranate seeds because they're now in season, they're naturally sweet, they add a little crunch and they're so pretty. Pumpkin Seeds: for me, pumpkin seeds are an underutilized ingredient in my diet, especially with how nutritionally dense they are. They're full of healthy fats, packed with vitamins, protein, as well as zinc, iron, and magnesium. You guys know I'm a sucker for a good salad dressing, so today we're whipping one up that is sweet, creamy, tangy and balances this salad out perfectly. The star of the show? You guessed, it tahini! 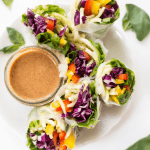 It's no secret that I love tahini dressings (have you seen my post about 4 ways to make tahini dressing?!) and this version is my go-to flavor in the fall. 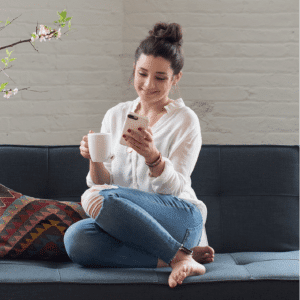 It's got apple cider vinegar which is not only detoxifying but also slightly sweet, as well as lemon for brightness, maple syrup for richness and mustard for a little kick. This dressing goes with pretty much everything too, so I suggest you make a triple batch and save it for the rest of the week! And that pretty much does it. This combo of ingredients really is perfect for fall! I love using warm ingredients in my salads this time of year because it helps the salad feel more cozy and comforting, but it’s also great for your digestion! A ton of raw veggies, when your body is already working hard to stay energized and warm, can be difficult to digest. They can cause gas, bloating and other unpleasant feelings in your gut. Cooked foods are often times much easier on your system, especially when our digestive system is more constricted and tight. That's why warm things feel so good this time of year! 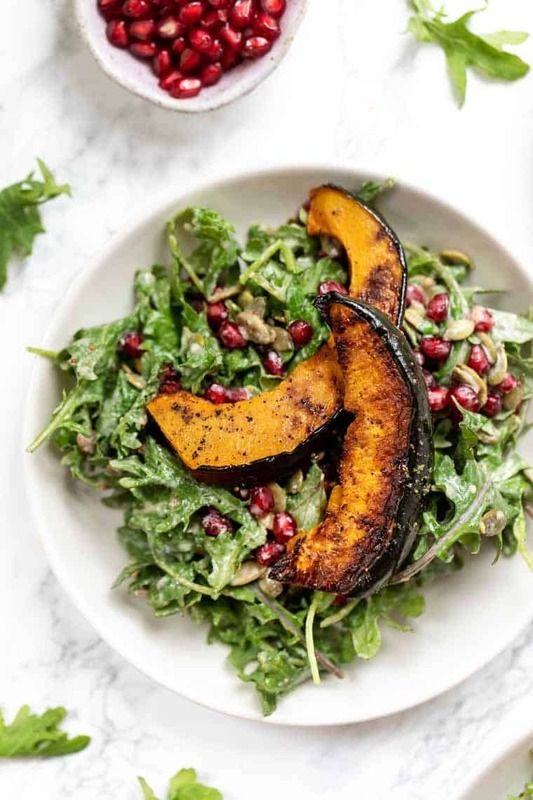 So add that roasted squash on top of your salad and get those greens in while still making your tummy happy! 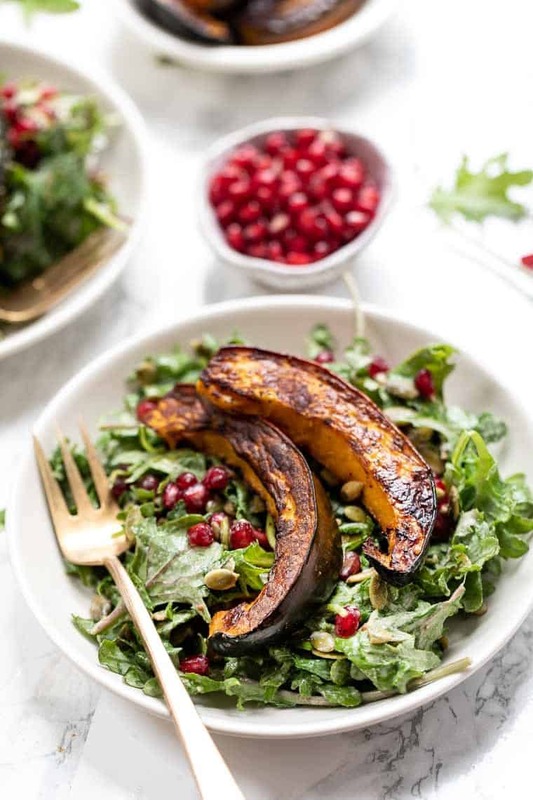 This simple fall salad is loaded with goodies! We've got roasted acorn squash, pomegranates, pumpkin seeds and a creamy tahini dressing too! Cut your acorn squash in half and scoop out the seeds. 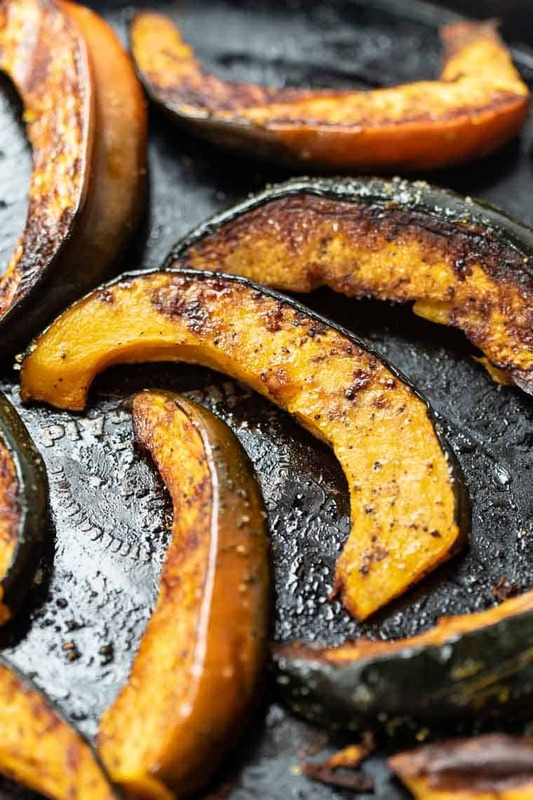 Slice into the squash into wedges and add the wedges to a baking tray. Drizzle with oil (or cooking spray) and sprinkle with sea salt and pepper. Bake on the center rack for 35 minutes, flipping halfway through. While the squash is cooking, you can prepare the rest of the salad. 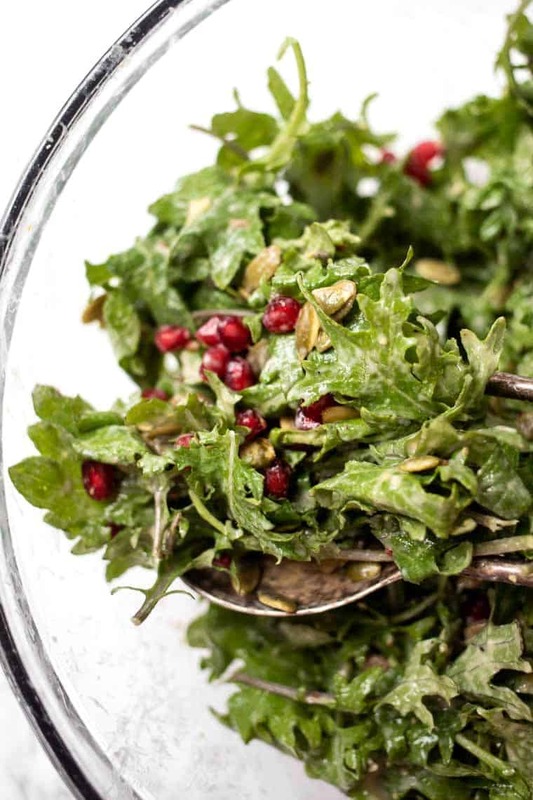 In a large bowl, add the greens, pomegranate seeds and pumpkin seeds. In a separate bowl, whisk together the dressing ingredients. Once the squash is done roasting, pour the dressing over the salad and toss to combine. Transfer to plates and top with 2 - 3 wedges of squash.